Designed and manufactured by Vishvkarma Industries for maximum productivity and high energy efficiency. This unique line milling machine is an effective solution for a multitude of dry* and liquid size reduction application. 1. Granulate any Nut Paste or make a smooth Peanut Butter. 2. Make Paste of Any Fruits and Vegetables. 3. Emulsifying Oil for Mayonnaise. 4. Communication of Corn for Cream Style Corn Components. 1. Mill Aloe Vera, Amla or Any Herbs. 2. Emulsify Cream for Ointments and Cosmetics. 3. Size Reduction of Any Chemical, Paint, Grease. 4. Mill cheese Curd to a fine consistency for processed Cheese Spreads /Products. 5. Make Chocolate Paste, Spreads. , Etc. Product is guided to the high speed rotating impeller. When product reaches the impeller, it revolves at high speed inside the cutting head. Centrifugal force propels the product outward past the cutting edges of the stationary reduction head. Small portion of product projecting into the spaces between the separators are cut off into flakes by spaced columns of vertical edges. These flakes fly outward away from the cutting head. How Cross Core Processor works? 1. Product is poured through Hooper which reaches the rotating screw through gravity. 2. Rotating screw moves the product and takes it towards the impeller tool which is covered with splasher. 3. Feed rate of screw can be controlled by varying the speed of driving motor placed behind Hooper. 4. Impeller projects the product to tool with high speed and force. 5. Splash case prevents the splashes of product to spread out side so it concentrates it in downward direction. 6. Final product is taken out below the splash case by placing a collecting container below it. 7. Final product is taken out by gravity. 8. The pulley and belt drive is used to increase the speed of impeller. 9. All the mountings are fixed on table. 10. All non contact parts are SS 304 and all the contact parts are SS 316. Knife on the impeller is used to pre chop and guide the product specially leaves to the impeller. Inside the cutting head impeller forces the product against uniformly spaced thin horizontal separators. The cutting head is a ring comprises of uniformly spaced vertical slots each with two knife edges. Each vertical edge is a sharp knife edge. The whole tool is joint less for maximum strength and is made of high quality food grade metal i.e. SS316, Die Steel. When product passes through the fine slots, the controlled size reduction takes place. I Can Make Paste of Any / Everything Just Try ! ASSURANCE FOR EXCELLANCE IN PRODUCTIVITY AND EFFICIENCY ! A superior range of Cross Core Comitrol manufactured by us is most commonly utilized in food processing, pharmaceutical, & chemical industries. 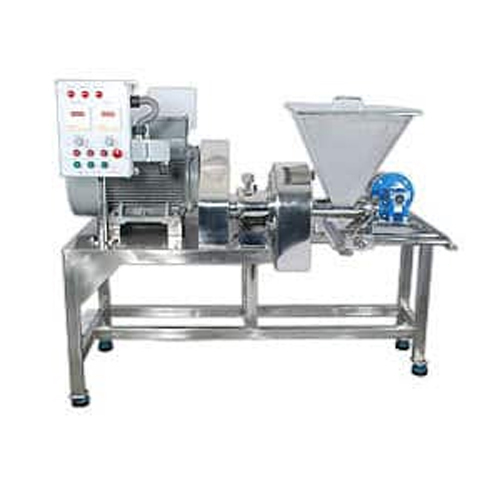 They are intended to be used for granulating paste and oil emulsification. All contact parts of these machines have been made using food grade SS304 alloy for assuring completely hygienic processing. They are equipped with a heavy duty motor that has ability to generate high amount of torque even at low speed. These comitrols comprise a hopper with lid for safe, easy, & efficient material feeding. They are also considered perfect for milling extracts of various herbs while formulating medicinal compounds and cosmetics as well.